So you've left things a little bit last minute. I'm not judging you, much. I'll let you in on a secret, I'm not finished my Christmas shopping either. 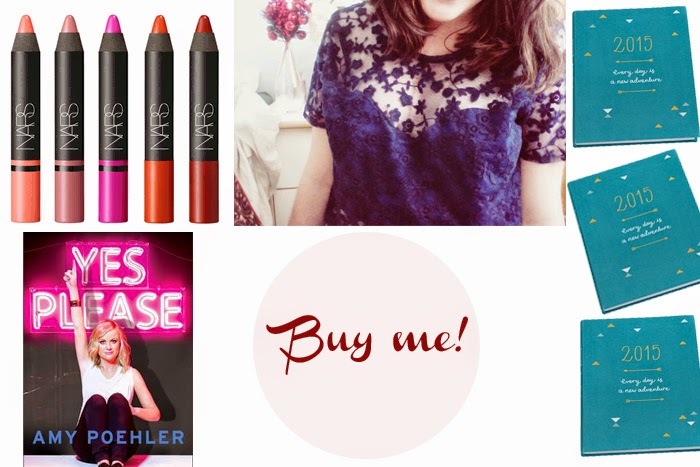 It's Blogmas Day 7 and we've all rounded up some of the best buys you can gift this season. They're easy to grab if you've left things a bit late too. I'd recommend making a list before you leave though as the malls will be frantic. Here's my recommendations for the last-minute shopper..
Nars Lip Pencil Coffret, limited edition-Now isn't this a beauty? Quite literally. You get three Satin and 2 Matte lip pencils from Nars in this set. A few of the shades are limited edition colours but my favourite Cruella is in there. They come beautifully packaged in an acrylic container which can always be reused after (hello makeup storage). If you're buying for someone who loves lip products they're bound to love this set. Amber Whitecliffe Maketu Tee-It might be obvious that I am a bit obsessed with this top and I do love supporting local designers who make their wares locally like Amber does. This top looks stunning on and the fabric is beautiful. Yes Please by Amy Poehler-This may well be one of the best memoirs I have read this year. Amy's is hilarious and filled with entertaining stories and life essays. She also has a brilliant tribute to her BFF Tina Fey in there. If they're a Parks & Recreation fan, an SNL fan, even just an Amy Poehler fan (like me) then this will go down a treat. Kikki K 2015 Inspire Diary-I've actually picked up this diary for myself and love it. It's colourful, but still grown up. In other words it won't look too childish on your desk. There's positive anecdotes throughout and plenty of space to write all those notes and aspirations down. Definitely check out Kikki K's diaries if you're in store. They have such a great selection. *What gifts do you think we should buy in the last minute Christmas rush?